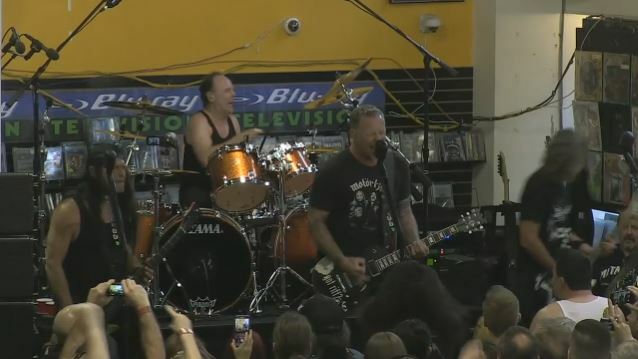 Grammy Award-winning Rock And Roll Hall Of Fame inductees and 2016 Record Store Day Ambassadors METALLICA performed live earlier today (Saturday, April 16) at Berkeley, California's legendary record store Rasputin Music in celebration of Record Store Day 2016. While a few lucky Met Club members and Rasputin customers won tickets to see the rare in-store performance in person, fans from around the world were also able to join from the comfort of their own living room via a live stream. You can now see video footage of the performance below. METALLICA ended the show by taking a bow and pointing out some of the special people in attendance, singling out family members, as well as Ray Burton, the father of late METALLICA bassist Cliff Burton; FAITH NO MORE drummer Mike Bordin; and Jonny and Marsha Zazula, who signed METALLICA to the Megaforce label in 1983. This is the third special show METALLICA has put out for free streaming in the past year, following a headlining set at last year's Rock In Rio USA and the concert they played in February at AT&T Park in San Francisco on Super Bowl weekend. METALLICA frontman James Hetfield said: "METALLICA has been lifelong supporters of record stores and indie retail, because… well, because we grew up with it and no one would play our stuff, so that's where would meet friends, meet fans, hang out at the record stores and get to find out what cool new music is out there." METALLICA drummer Lars Ulrich added: "Independent record stores are part of METALLICA's DNA. They have been pivotal in shaping each one of us into the music fanatics we've all become. We could not be any prouder to be Record Store Day Ambassadors for 2016 and are looking forward to screaming from every rooftop the next few months about everything independent record store and beyond." Previous ambassadors have included FOO FIGHTERS frontman Dave Grohl and Jack White. 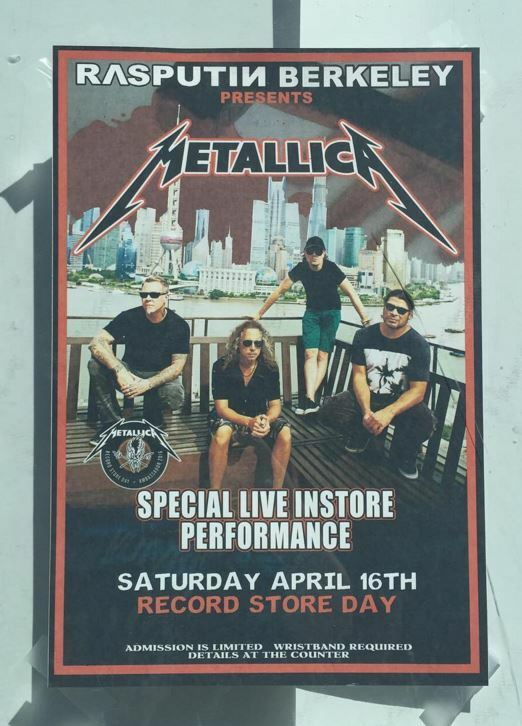 Throughout the nine years that Record Store Day has been in existence, METALLICA has participated with events and special releases. The band did a meet-and-greet with fans at Rasputin Records in Mountain View, California back in 2008 to help kick off the very first Record Store Day. Last year the group issued a cassette version of its original 1982 demo, "No Life 'Til Leather", which ended up being Record Store Day 2015's biggest seller. Following the tragic terrorist attacks in Paris in November 2015, METALLICA's release for this year's Record Store Day is "Liberté, Egalité, Fraternité, Metallica! - Live At Le Bataclan. Paris, France - June 11th, 2003", a CD featuring a live recording of METALLICA performing at the same venue that was the site of the deadliest of the November attacks. Proceeds from sales of the CD will benefit Fondation de France's Give For France charity. METALLICA has also released deluxe reissues of its first two albums, 1983's "Kill 'Em All" and 1984's "Ride The Lightning", on Record Store Day.